This visual explanation will help you understand the basic terms that Google Analytics uses to organize your data. Google Analytics created a new vocabulary to help digital marketers analyze their website traffic data. Terms like sessions, pageviews, filters and segments have all been used by web analytics tools in the past, but Google Analytics was the first to combine them into a powerful free tool. On one hand, this is wonderful- you can write complicated queries, create custom reports, and set goals after a quick 15-minute setup process. But on the other hand, it creates a big barrier to entry- you must learn how all these new concepts work together so you can understand your own data. 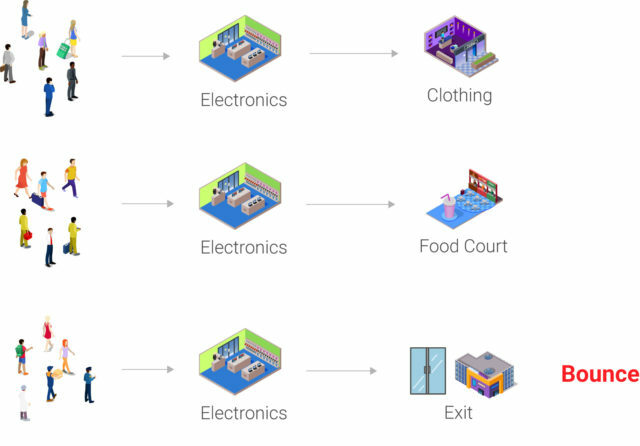 After thinking about these concepts for a few hours, I realized these Google Analytics concepts were similar to the organization of a shopping mall! So, if you have ever visited a shopping mall, you can understand the basics of Google Analytics. I will explain a few of the terms from the perspective of a mall visitor, and other ones from the perspective of a mall manager- the person who is in charge of making sure that people actually make purchases at the mall. First we will cover some common metrics and dimensions and then get into the different ways to organize your data. If you are looking for a more technical explanation, check out our guide to common confusing Google Analytics terms. Okay, let’s say that 25 people enter your mall over the course of one day. It’s a very slow day, apparently. This is a metric combined with a date range. A metric is a quantitative measurement of some activity on your site. This example is similar to the Google Analytics concept of “Users”- how many people enter your site in one day. This doesn’t tell us very much, however. Not all website visitors are equally valuable- you will need to look closer at your data to find the visitors who are serious about buying. Let’s say you learn that people with suitcases or other baggage have a lot of money. You want to analyze the activity of just the people holding baggage. That is a metric that is combined with a dimension. The metric is all visitors to the mall over the course of one day. The dimension is “baggage carriers” (I made that up). So, you could run a report on just the baggage carriers to see how they behaved within your mall- how many shops they visited, how much they purchased etc. Users, sessions and pageviews are three ways of measuring your website’s ability to acquire traffic. Here’s how they work together in the context of a mall. Google Analytics (GA) has the same structure. Users are individual people that visit your site. GA determines this via a browser cookie- a tracking ID based on the browser from the user’s computer. An individual user can have multiple sessions- he or she can visit your domain multiple times over the course of weeks or months. 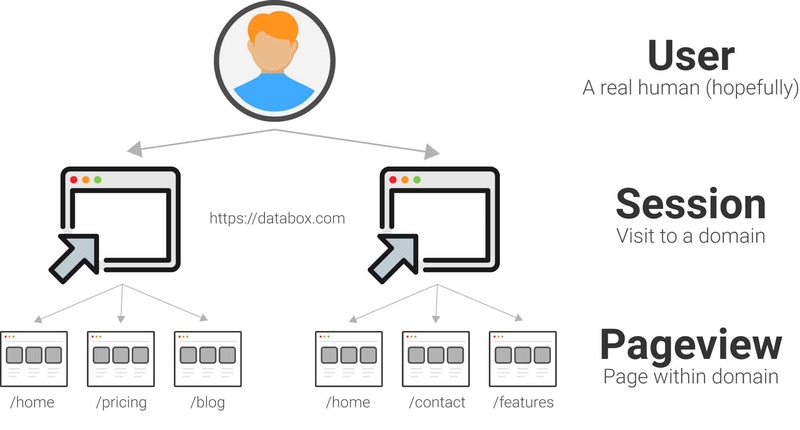 A session is a visit to the domain as a whole, like https://databox.com. Within that session, a user can visit multiple pages, like /blog, /features and /pricing. Those count as pageviews. A session has one or more pageviews. The diagram above is slightly misleading, however. Google Analytics also tracks the order of the pages within the session. This introduces the concept of a landing page– the first page that a user visits within the session. Think about the times that you visit a mall. You usually enter through one store in particular, like a department store. So, if you were a mall manager, you would probably want to know whether mall visitors continued on to other stores in the mall, or left after finding what they wanted in that store. Here is how this works in Google Analytics. We just covered a few acquisition metrics. 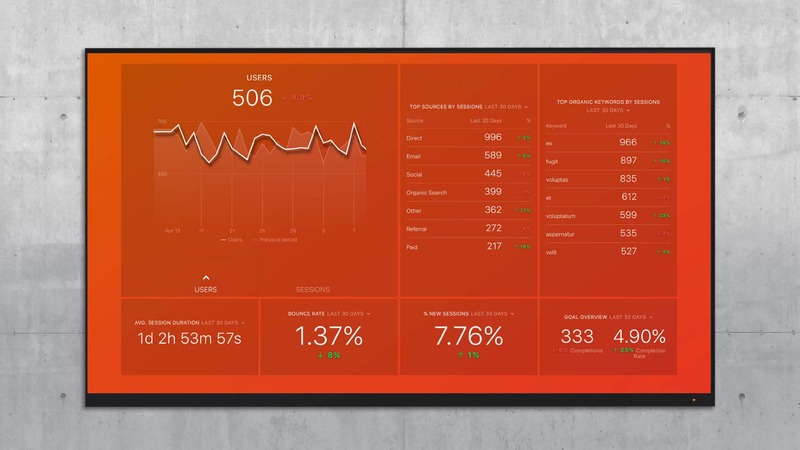 Now let’s get into behavior metrics- what users actually do on your site. One common way to measure the quality of your content is via time spent on site. Once users reach your site, do they actually read or watch what is on the page? Or do they leave immediately? If a user spends more time on page, it is more likely that they will take a key action, like sign up for your newsletter or buy a product. A mall has the same goal. The longer that a visitor spends in a mall, the more likely that they will buy more stuff. (I’m assuming that most mall visitors don’t just go to hang out.) Google Analytics has two metrics to measure this behavior- session duration and time on page. Here’s one important note- Google Analytics has no way to count minutes and seconds for the last page visited within the session. Google Analytics uses timestamps that fire when a user opens a new page within your domain, so on the last page of the session, the timestamp will count 0 seconds. Time on Page looks at the time spent on an individual page. When calculating the average time on page, we remove all the people that exited the page so that we do not skew the number. This is like looking at the time that somebody spent in an individual store before moving on to the next store. All people that left the mall from that store are not counted. Session Duration looks at the total time spent across the entire session. It includes exits on the last page, so it is considered a less reliable metric since the last page will always have a value of 0. If you enter a mall, and cannot find the entrance to the rest of the mall… or look around at a few items before leaving… that probably means you had a bad experience, or did not find what you are looking for. The whole point of the mall is to make it easy to visit multiple stores at the same trip. Similarly, your site should encourage visitors to check out multiple pages… unless they are ready to buy something immediately. Segments allow you to strictly looks a subset of all visits to your site. You can create segments based on user-level, session-level or page-level (hit-level) events. It is a lot easier than rebuilding every report for individual dimensions. Segments allow you to quickly flip between different subsets of your data. Let’s say that there is a new food court in the mall. As the mall manager, you would like to know how the new food court affects purchase habits. 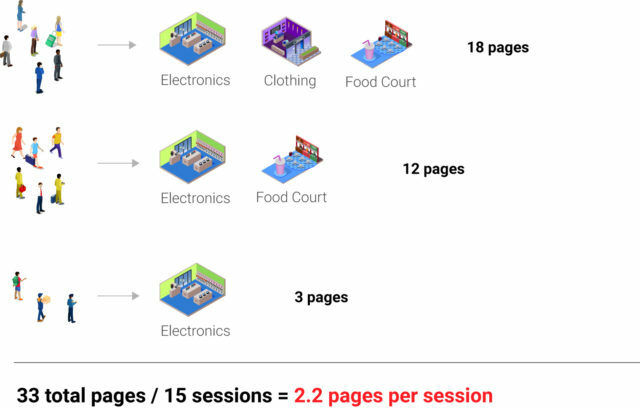 In Google Analytics terms, you need to create a new segment that specifically looks at all people that visit the “Food Court”. That would be session-level data. Then, you can look at metrics like average number of stores visited and average purchase amount, and compare between the food court visitors and the entire population. 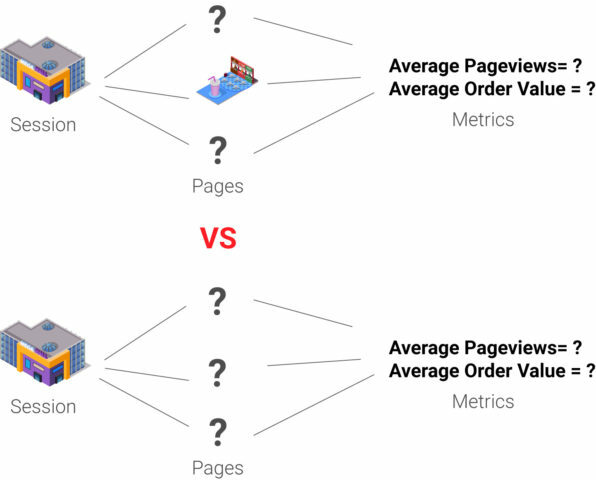 Those map to the “Average Pages/Session” and “Average Order Value” metrics in Google Analytics. In Google Analytics, goals don’t really add new measurement capabilities. They just allow you to clearly communicate the most important conversions or events on your site. For example, let’s say that you are the mall manager, and you want the average mall visitor to visit 2.5 stores during their trip. That corresponds to the “Average Pages/Session” metric from Google Analytics. You could set that as the goal for the month or year to let your team know about the top priority. 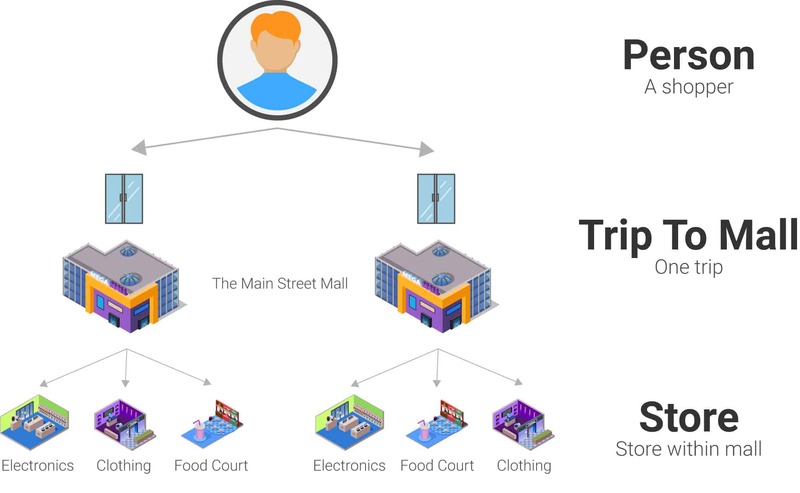 In the example above, 6 visitors stopped at three stores, 6 visitors stopped at 2 stores, and 3 visitors stopped at 1 store. That means the average visit included 2.2 stores. You should now understand the structure of your Google Analytics data. Okay, let me add a quick caveat to that. I covered a few key behavior and acquisition metrics, but Google Analytics can measure hundreds of metrics on your website. For example, it helps you measure your site performance to ensure that your pages load quickly. It has many specialized metrics for e-commerce stores. 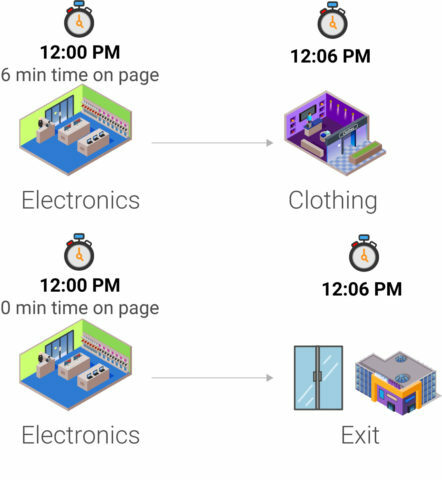 And it can even connect to AdWords to measure the behavior of visitors that visit your site from pay-per-click (PPC) ads. Each one of those is a specialized discipline that requires hours of learning. But, if you are just looking to measure normal site behavior, the metrics above should help you. Next, you can begin investigating your data to discover where your marketing and user experience need improvement. We put together a guide on 10 popular Google Analytics dashboards to help you understand common strategies for analyzing site data. Here is an example, our Web Traffic dashboard.